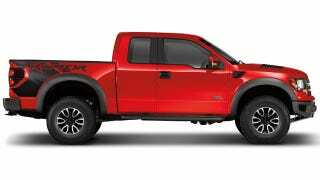 Ford's 2012 model updates for the every-terrain F-150 SVT Raptor bless it with a few nifty new tricks, like a front grille-mounted camera. But it also decided kill the best Raptor color, Molten Orange. Why can't we have nice things? The rest of the exterior updates involve wheel choices and new bodyside graphics including a new "RAPTOR" sticker that should come with a free bottle of Axe body spray. Also, they've killed the graphics that we've come to un-affectionately call — "pixelated mud splash." Ford's non-cosmetic tinkering with the Raptor stops at two: a new Torsen front differential for better grip and the front camera, which can be turned on at speeds below 15 mph and uses the navigation screen to show you your front approach angle in place of a human spotter. What we wouldn't give for a similar camera on the Shelby GT500 facing rearward in order to snag ourselves a true burnout video from the rear. And the red shade shown above comes at the expense of the orange that was an unusual bit of flair for truck paint. The staff of people who pick colors for a living at Ford probably had their reasons for killing it, but those wise enough to buy one now have a collector's item henceforth known as Great Pumpkins.